Christine is a Licensed Veterinary Technician. 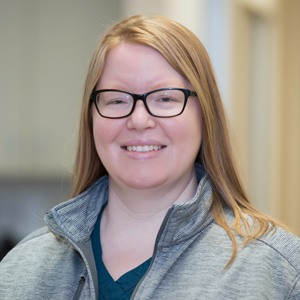 She graduated from Macomb Community College's Veterinary Technician Program in 2016 with an Associate of Applied Science Degree in Veterinary Technology. Christine did her internship at AEC before being hired on full time. Almost all of her veterinary experience has been working in an emergency setting. Christine worked in advertising for 20 years before deciding to make a career out of her love for animals. Christine has three dogs (Lindy, Emma, Moose), one cat (Hodgeman), a 24 lb leopard tortoise (Dee) and a hamster (Megabyte)! She loves kayaking, camping and gardening.